The Art Museum: "Have You Seen Googie?" Sure you have, even if you don't know it (and if you're old enough). 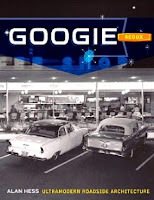 "Googie" is the name given to the space-aged style design of commercial architecture in the mid 20th century, that reflected the zeitgeist of our overall futuristic mindset. Think of the Jetsons, and you get the idea. This style of architecture began and expanded mostly on the West Coast, but can be seen here and there (where it hasn't been torn down already) across the United States. 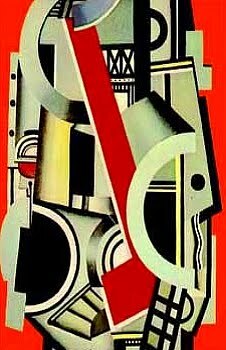 Googie grew out of the streamline style, and mutated into the various shapes of stars, boomerangs, amoebas, flying saucers, rockets, and other popular images that evoked our intended future in space and beyond. Some of the best examples are coffee shops, motels, gas stations (see above, Palm Springs), fast food joints, and bowling alleys. 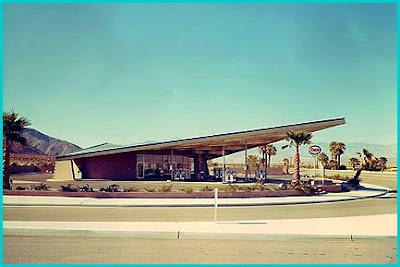 Even McDonald's original golden arches were a part of the early Googie style, similar to the LAX building. Many futuristic Googie styles were also born at the Seattle and New York World's Fairs and copied around the U.S. The sweeping arches and jutting supports seemed to defy gravity and make customers feel as if they were next to, or inside of, a hovering spacecraft. Suddenly new buildings were sporting alien looking spires or floating parabolic rooftops. Even churches, especially Protestant, got into a (albeit subtle) futuristic mood resulting in some very ethereal houses of worship. And they were mostly made of clunky flagstone, concrete, and steel, mind you -- not the lightweight composite materials available today -- with lots of glass. This made the eerie floating effect of the designs seem all the more intriguing because of the contradicting heaviness of the materials. Designers had a lot of fun with lettering as well. Text hovered all over the signage, and resembled bubbles, stars, and other heavenly objects of our imagined birthright to the universe. Colors used were often the popular shades of the 50's -- mint green, melon, turquoise -- but when outer space was put into the mix, any bright neon colors on the background of dark blue space were appropriate. Unfortunately most of these funky space-aged works of art have either been left to deteriorate on vacated lots, or are being systematically demolished, to be replaced by the bland imagination-less buildings (or the self-important gargantuas of New Las Vegas) currently popular today. Thankfully there are local organizations springing up to attempt to save these artifacts of the spirited era that conceived them, but many of the best have been lost. So go out and find some Googieness where you live, and take a few pictures just in case it won't be there very much longer. OOOooohhhh!!! I definitely recognize it.... just didn't realize it had a name. Neither did I until I bought the first edition of that book in the 90s. There was so much of this architecture in CA back in the day, that it was like growing up in Disneyland! A great site archiving a lot of this in old postcards is www.lileks.com.